Soar above it all on this 45-minute flight over the forested hills, exclusive neighborhoods, and seaside towns of Los Angeles. See the Downtown skyline, Hollywood sign, Griffith Park, and the curve of the Pacific coast from above the noise, crowds, and traffic. Gain a new appreciation for the vast geography and stunning scale of the City of Angels. Choose from two routes, flying out over Downtown to Santa Monica, or to the shores of Malibu and Santa Monica. Bottled water and snacks are included on board. 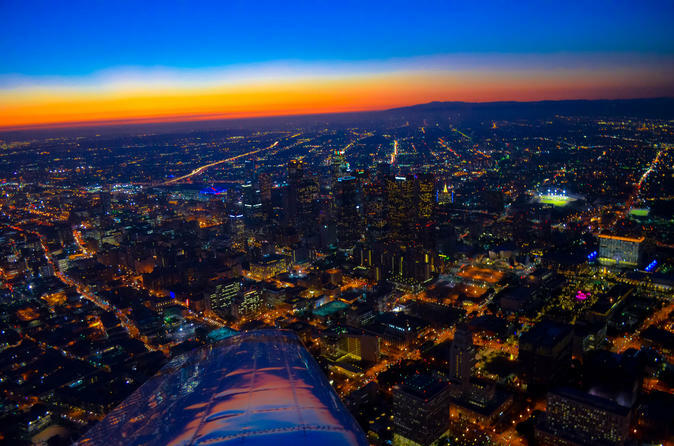 This unforgettable 45-minute airplane ride lifts you above the traffic and sprawling city streets to reveal the true magnitude and beauty of the City of Angels. Arrive at Van Nuys Airport just north of the city and meet your private pilot at a time you designate. Choose between two scenic routes: DTLA to Santa Monica, or Santa Monica to Malibu. The DTLA–Santa Monica route takes you above the San Fernando Valley over Griffith Park (and the Hollywood Sign), Universal Studios, the LA River, Dodger Stadium, and the Downtown skyscrapers before heading out over the Santa Monica Mountains to the coast. See Beverly Hills mansions from above, the UCLA campus, LAX, and finally the world-famous Santa Monica Pier. On your return to Van Nuys you'll fly over the Sepulveda Pass on "the 405," L.A.'s notoriously crowded freeway, and enjoy stunning views of Bel Air, the Getty Center, and Stone Canyon Reservoir. The Santa Monica–Malibu route heads west from Van Nuys toward Topanga Canyon, revealing breath-taking views of the Malibu Hills and various nature refuges. Fly through Malibu Canyon to the Malibu Pier on the Pacific, noting the many celebrity homes along the famous coastline. Get stunning up-close views of Stone Canyon Reservoir, Bel Air, the Getty Center, and UCLA as you continue toward Pacific Palisades and Santa Monica before returning to Van Nuys. Enjoy complimentary bottled water and snacks on board. Note that flight times may vary based on departure time, weather, and air traffic patterns.